Back in May when I visited Bangkok I met Ajarn Sulak and he informed me that the INEB* Conference would be held in Taiwan in September. I offered to help and soon I found myself busily involved in the planning and organisation of the conference. 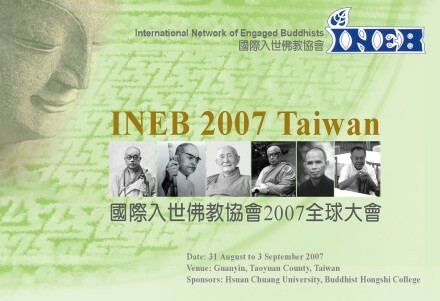 The conference took place from 31 August to 2 September 2007 at Buddhist Hongshi College (?????? ), near Zhongli. A four day study tour visiting Buddhist organisations around Taiwan took place after the conference. The first formal event of the conference was a press conference. This was held at the Keng Tu Yuan (???) in Taipei on 29 September. The media contingent was small but included BLTV (????? and the Apple Daily (????). The panel of speakers at the press conference was made up of Ven. Chao Hwei (?????) and Ven. Shing Guang (?????) of Hongshi College, Dr Yo Hsiang Chou (??? ), chief coordinator of the conference, Mr Zhang, the owner of Keng Tu Yuan, and myself. I am not sure if any reports appeared in the Chinese media, but the China Post and Taipei Times both carried articles. The conference bought together about 60 participants from 15 different countries. Most arrived on 31 August before the opening ceremony was held in the afternoon. It was great for me to be able to meet some of the people I knew from when I used to work in Ajarn Sulak’s office in Bangkok. Phra Santithammarangsi, the monk on the right of the picture above, attended a course I taught at the Wongsanit Ashram in 2002. It was a great honour to be able to welcome Ajarn Sulak to Taiwan. The last time Ajarn visited Taiwan was in 1998 to receive the Unrepresented Nation and People Organization (UNPO) Award. He is pictured above with Ven. Shing Guang and Ven. Chao Hwei shortly after arriving. Yeh Chu-lan (??? ), Secretary General of the Presidential Office, was a special guest at the opening ceremony. She gave a short speech about her personal experience of Buddhism. The other speakers were Ven. Chao Hwei, Prof. Hsia Cheng-hua (??? ), President of Hsuan Chuang University (???? 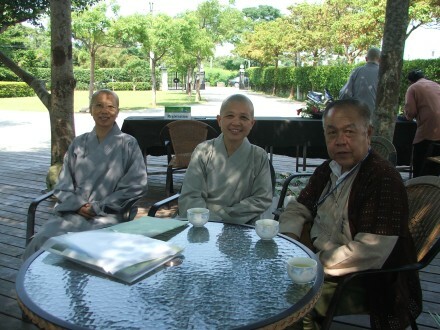 ), Ajarn Sulak Sivaraksa and Dr Yo Hsiang Chou. 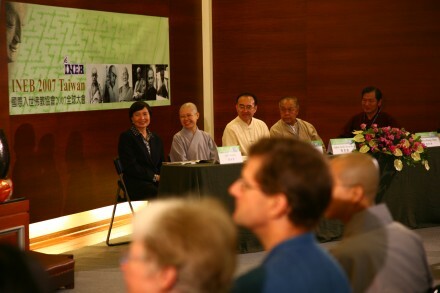 The theme of the conference was “Engaged Buddhism: from Social Welfare to Social Change”. This is a point that Ajarn Sulak frequently emphasizes. He says simply offering charity to the poor is not enough. There is a need to challenge the status quo and overcome structural violence. As I was busy with working behind the scenes I didn’t really have the chance to participate in the proceedings of the conference. At the closing ceremony Ajarn Sulak announced that Ven. Chao Hwei would become the fourth patron of INEB. The three patrons of INEB are His Holiness the Dalai Lama, Thich Nhat Hanh and Ven. Somchai Kusalacitto representing the three main Buddhist traditions. Ajarn Sulak said he felt it was very important to have a bhikkhuni as patron for more balance. I don’t think there could be anyone better qualified than Ven. Chao Hwei to take on this role. I felt it was a very special moment. I must express my sincere thanks to Ven. Chao Hwei and all the staff and students at Hongshi College. They were the most wonderful and generous hosts. A report on the study tour will follow soon. # More photos of the conference at flickr. Update: Also see thephotos on the Hongshi College website. content but you should rank your page higher in search engines.